James Wilson was born in September 14, 1742 at Carskerdo, Fife, Scotland near St. Andrews, Scotland. Here, he received his education at many different universities including St. Andrews, Glasgow, and Edinburgh without receiving a degree. Instilled with the ideas from the Scottish Enlightenment, James Wilson then moved to America, during the tensions of the Stamp Act in 1765. Early the next year, James Wilson accepted a position at the College of Philadelphia as a Latin tutor with the help of very valuable letters of introduction. James Wilson petitioned the college to give him a degree, and several months later he was awarded an honorary Master of Arts. Afterwards, he left to read the law under John Dickenson. After studying for two years, he was admitted to the Philadelphia bar in 1767. The next year, James Wilson set up his own law practice in Reading, Pennsylvania. This office was very successful and he was able to earn a small fortune. Two years after, James Wilson moved westward to Carlisle, Pennsylvania, a Scotch-Irish settlement. The afterwards, he got married to Rachel Bird with whom he had six children with. James Wilson specialized in land law and he was able to build up a broad clientele. He also began to speculate in land by using borrowed capital. He also started to lecture about English literature at the College of Philadelphia as well. James Wilson soon became very involved in Revolutionary politics. In 1774, he became the chairman of the Carlisle committee of correspondence, went to the very first provincial assembly, and published the “Considerations on the Nature & Extent of the Legislative Authority of the British Parliament”. This writing was heavily circulated in both England and America, establishing James Wilson as a Whig leader in America. The next year, James Wilson was elected to the provincial assembly as well as the Continental Congress, where he mainly sat on the committee for military and Indian affairs. In 1776, James Wilson joined the moderates in Congress due to the wishes of his constituents and voted for a 3-week delay in looking at Richard Henry Lee's resolution for independence on June 7. However, on the July 1 and 2 ballots, James Wilson voted in the affirmative for independence and signed the Declaration of Independence on the same day. James Wilson's strong opposition to the 1776 Republican Pennsylvania constitution, besides showing a switch to conservative views on his part, resulted in his removal from Congress the next year. In order avoid the talk among his frontier constituents, James Wilson went to Annapolis for the winter of 1777 and 1778 and then went back to live in Philadelphia. James Wilson confirmed his new political stance by identifying closely with the conservative and aristocratic republican groups, which multiplied his business interests, and accelerated his land speculation. James Wilson also took a seat as Advocate General for France in America between 1779 and 1783, where he dealt with maritime and commercial matters, and defended Loyalists and their sympathizers in legal matters. In fall 1779, during a time of food shortages and inflation, a mob of people which included militiamen led by radical constitutionalists, went out to attack the republican leadership. James Wilson was one of the prime targets of this attack. James Wilson as well as around 35 of his colleagues closed themselves in his home at Walnut and Third Streets, known after as "Fort Wilson." During a short skirmish, many people on both sides were wounded or killed. The shock of the situation cooled sentiments and pardons were given all around, though there were many major political battles regarding the commonwealth constitution yet to come. 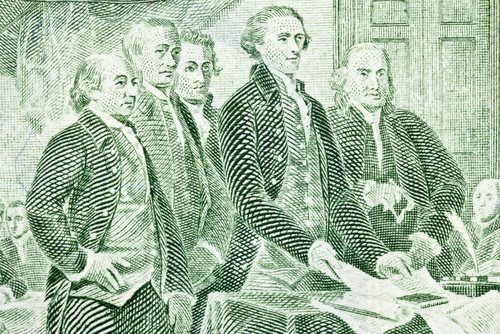 In 1781, Congress appointed James Wilson as one of the directors of the newly founded Bank of North America, which was created by legal client and close associate Robert Morris. In 1782, when the conservatives had regained a little of their political power, James Wilson was reelected to Congress, where he served between 1785 and 1787. James Wilson reached the highlight of his career in the 1787 Constitutional Convention, where his influence over the delegates was only second only to that of Madison. James Wilson rarely missed a session and sat on the Committee of Detail and applied his impeccable knowledge of political theory to many convention problems. Gouverneur Morris was the only person at the Constitutional Convention to give more speeches. That same year James Wilson overcame powerful opposition and led Pennsylvania for ratification, making the state the second one to oppose the Constitution. The new commonwealth constitution, which was drafted in 1789 to 1790 along the lines of the United States Constitution, was mainly Wilson's work and represented the purpose of his 14-year fight against the 1776 Constitution. For his services in helping form the federal government, President Washington named James Wilson as an associate justice in 1789, although James Wilson expected to be named Chief Justice of the Supreme Court. That same year, James Wilson was also chosen as the very first law professor at the College of Philadelphia. Two years later, he started an official digest of the Pennsylvania laws, a project Wilson never finished, although he carried on for a short time after his funds ran out. James Wilson, who only wrote a couple opinions in the Supreme Court, did not achieve the success in the Court that his abilities and experience promised. During those years, James Wilson found himself being at the center of much criticism and he only barely escaped impeachment form the court. He tried to influence the ratification of a law in Pennsylvania that was favorable to land speculators. From 1792 to 1795 James Wilson also made large, unwise land investments in Pennsylvania and Western New York, along with in Georgia. These mistakes did not deter him from creating a grandiose but ill-fated plan, involving large sums of European capital, of recruiting European colonists and settling them in the West. Meantime, as a widower with six children, James Wilson remarried to Hannah Gray in 1793. They only had one son who died in infancy. Four years later, James Wilson moved from Philadelphia to Burlington, New Jersey in an attempt to avoid arrest due to his debt. The next year, while on federal circuit court business, James Wilson arrived at Edenton, North Carolina, in a state of acute mental distress and was moved into the home of James Iredell, another associate Supreme Court justice. James Wilson died there within a few months on August 28, 1798 at the age of 55. Although he was first buried at near Edenton at the Hayes Plantation, his remains were later moved to the Christ Church at Philadelphia.